Who doesn’t want to live the longest, healthiest life possible? I know I do! So what if YOU could unlock all the secrets of the longest-lived people on the planet? Well, I’ve got great news: You can. In my latest book, The Longevity Paradox, I pull back the curtain on the secrets of the world’s “super-agers” and explain how YOU can live a longer, more active life. You’re going to learn what I call the “7 Deadly Myths of Aging” and the Nobel Prize-winning secret proven to extend the human lifespan. And the best part is it’s not rocket science — in fact, most of my recommendations are things you can start doing at home today to de-age your skin, reduce joint pain, and get up and active again. So to give you a sneak peek at the new book, I’ve made this special episode of the Dr. Gundry Podcast. Listen in to learn three of the most common aging myths and what you can do about them. I’m also going to share the #1 vitamin you need to add to your diet right now to activate your telomeres, a key marker of longevity. Announcer: 00:00 Hey there, welcome to another exciting episode of the Dr. Gundry podcast, the weekly podcast where I give you the tools you need to support your gut, boost your health and live your youngest healthiest life. 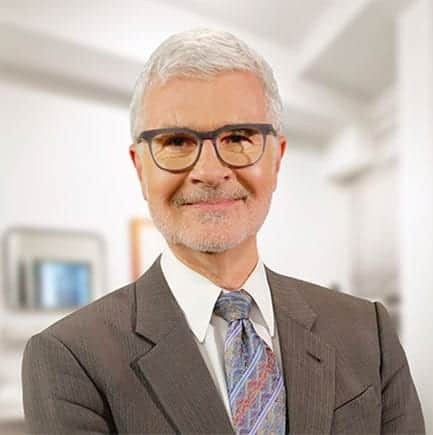 Dr. Gundry: 00:19 Each week, Dr. Steven Gundry, a cardiologist, medical innovator and author of New York Times bestsellers, the Plant Paradox and the Plant Paradox Cookbook shares the latest and cutting edge health information. He’s excited to be a part of your unique health journey. So let’s get started. Dr. Gundry: 00:37 Hey everybody. Welcome to a special edition of the Dr. Gundry podcasts. I’m going to tell you all about my new book, the Longevity Paradox, how to die young at a ripe old age and it’s available at Barnes and Noble, Amazon, and your local bookstore, and this is going to be like the plant paradox. I guarantee you, a big game changer. Dr. Gundry: 01:03 I wanted to give you a little tease to get your appetite whetted for living longer, but living better longer. And that’s really the longevity paradox. Most of us kind of look at what’s happening to our parents or our grandparents or our great grandparents and we kind of don’t like what we see. People are getting knee replacements, hip replacements, and that doesn’t sound very good, and it doesn’t sound very good because it isn’t very good. But what’s exciting about the research that I’ve done with my patients and the research that I’ve done in the literature is that it doesn’t have to be that way. 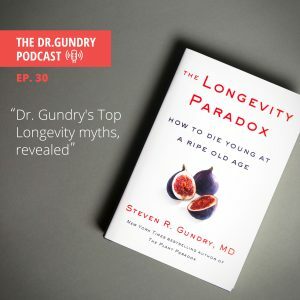 Dr. Gundry: 01:42 So today just a few teasers of longevity secrets and myths. First of all, there’s a myth that animal protein is really important for you as you get older. And in fact, that’s not only a myth, but it’s absolutely wrong. Now, as a young man from Omaha, Nebraska and Milwaukee, Wisconsin, I can tell you that, you know, I come from cattle country and unfortunately animal protein is one of the biggest causes of getting old faster there is, sadly. And I talk a lot about this in the plant paradox, but I bring even more information to the longevity paradox. It turns out that animal protein, and it doesn’t matter if the animal is a fish, it doesn’t matter if the animal’s an egg, if it doesn’t matter, if it’s cheese, animal proteins absolutely cause you to age quicker. And absolutely in the case of beef, lamb and pork increase your risk of developing cancers. And cancers quite frankly, are almost completely preventable as long as you follow a few of important steps in the longevity paradox. And I take you through all that as we go on. Dr. Gundry: 03:05 One of the interesting things about the blue zones, and I’m actually the only nutritionist who has actually spent most of their career living in a blue zone, and that’s Loma Linda, California. And I can tell you that the unifying principles of the blue zones, in other words, what their diets all share is not the common things that you’re told about. All the blue zones do not eat whole grains. All the blue zones do not eat beans. That’s a myth. In fact, that is not a unifying feature of the blue zones. And as I talk about in the longevity paradox, the whole grains that some of the blue zones eat and the beans that some of the blue zones eat or actually a negative part of their diet that’s overcome by other very positive parts of their diet, including generous use of olive oil in three of the blue zones, but the unifying feature of the blue zones which was common to Loma Linda. Dr. Gundry: 04:12 It’s common to Sardinia as common to Crete. It’s common to Acciaroli it’s common to Kitabins, is very, very little animal protein. That’s actually the uniting factor and as I talk about in the longevity paradox, one of my colleagues, Gary Frazier from Loma Linda has shown that the vegan adventists are actually the longest lived of all of the long lived adventists, and again, the unifying feature of all the blue zones is not the grains and beans. It’s actually limited animal protein. Does that mean you have to give it up? No. In fact, I’m going to give you a bunch of tricks in the book on how to have your cake and eat it too. In this case, how to have your meat and eat it too. So great tricks are coming up. Dr. Gundry: 05:07 Unfortunately, I used to love animal protein. I still consider myself a veg-Aquarian. That means I eat mostly vegetables, can eat fish on the weekends, particularly wild fish or wild shellfish, but it’s a very little part of a normal diet and one of the biggest questions I always get asked is, Dr. Gundry, you know, what am I going to do for protein? Remember a gorilla eats 16 pounds of leaves every day and he’s got more muscle mass than you’ll ever have. A horse eats grass and weeds and he has more muscle mass you ever have, they do not eat animal protein. In fact, all the largest animals on earth get all their protein from eating grass and leaves and believe it or not, you can too. As I show in the book, there’s some very good studies of trying to supplement seniors with extra animal protein and we actually found out that it did not benefit them in muscle mass, in energy, these are all myths that are perpetrated by people who are interested in selling you animal protein. Dr. Gundry: 06:20 Okay. Number two, you’ve got to have a high metabolic rate to stay healthy. In fact, one of the things that I have found in my research of my patients, the super old that I see in Palm Springs, they don’t call Palm Springs God’s waiting room for nothing. I’ve had the privilege of dealing with large numbers of 90 and a hundred year old people who are thriving. And one of the things we find consistently, both in my research and in other researchers is that contrary to expectations, they run a low metabolic rate, they actually run a low temperature, a low basal temperature. Now why is that? Well, it turns out that energy efficiency predicts along lifespan, and I like to use the example of what’s happened in, for instance, hybrid cars. A Toyota Prius or a car with a four cylinder engine with turbo charging and a supercharger can develop the power of an eight cylinder, 12 cylinder engine, but use very, very, very little gas. Dr. Gundry: 07:36 And as I talk about in the longevity paradox, what I want to do is teach you how you become a turbocharged supercharged four cylinder engine that will actually have the power of a V8 or a V12 now you can if you want to burn through a lot of fuel with a 12 cylinder engine, but in the long run it’s the efficiency of burning fuel that actually determines who’s going to live a long time and teaching you how to be an efficient fuel burner is really one of the second big tricks of the book. The other thing that’s fascinating, is we can actually measure your literal fuel efficiency by looking at actually, something you probably had done in your doctor’s office and that his hemoglobin A1C. Almost every night you see commercials for I got to get my A1C to goal or I’ve got to get my A1C in range. Dr. Gundry: 08:43 Well A1C actually measures what are called advanced glycation end products and they’re nicknamed ages for short, A-G-E. Ages occur from heat binding protein and sugar molecules together and what’s one of the strongest chemical bonds that’s ever been described. It’s called the Mallard reaction. So you have heat in your body, you eat protein, you eat sugar, and we can actually look at these charred bits in you. If any of you have ever grilled a steak, you know that the crusty bid on the outside, the good stuff that’s actually advanced glycation end products, those of you who have a liver spots or age spots on the back of your hand or elsewhere, those are advanced glycation end products and they’re actually you aging. And as I’ve described to myself, a number of my other patients, and I bring a new funny one in on the longevity paradox, you can actually de age and you can actually watch these age spots disappear by changing your diet and using these tricks. Dr. Gundry: 10:07 Number three, there’s a myth that saturated fat is good for you. Most of the folks in the Paleo and Keto communities think that the more saturated fat that you eat, the better. In fact, this was first posited as the cause of heart disease back in the 1950s by a very famous nutrition researcher from the University of Minnesota by the name of Ansell Keys. He’s incredibly demonized in the Paleo and Keto communities because he did a study to find out why Dwight Eisenhower in the 1950s had a heart attack. Ansell Keys develop the K ration in World War II that kept our troops alive. And so he was brought in to find out why President Eisenhower had a heart attack. He published a very famous study called the seven countries study ,that purported that animal fat, the more saturated fat that people ate, the higher their risk of heart disease. Dr. Gundry: 11:19 Now he presented his findings to the World Health Organization and the World Health Organization believed what he said. And so the low fat movement came about. Now I’ve looked at Ansell Keys, all of his studies. I looked at them over and over again. And interestingly enough, Ansell keys is tied for the longest living nutritionist on record. He and an Italian from the 1500’s by the name of Luigi Carneros, who you’ll get to know in the book. They both died at about 102 years of age, but Ansell Keys retired and lived in a village south of Naples, right next to a very famous blue zone called Acciaroli. And Ansell keys, I’ve had the pleasure of interviewing his housekeeper, ate huge amounts of olive oil. Now olive oil is not a saturated fat, but what happened with Ansell Keys was people took his data and they thought he was demonizing fat. He wasn’t at all. He was demonizing animal saturated fat. Dr. Gundry: 12:28 And in fact he was one of the original critics of the cholesterol theory of heart disease. And we’ll talk about that in a minute. So what I’ve looked at Ansell Keys data and my own data in that animal fats are associated with animal protein. And it was actually the animal protein that was the big mischief maker in the animal fat, the saturated fat hypothesis. Now, so having said that, the more olive oil that I can get into you, the better your longevity. And the better your brain health. And I’ve got a lot of tricks in the longevity paradox to tell you how to use olive oil or the polyphenols in olive oil to maximize your brain health and your lifespan. And there’s some really exciting things in there. Dr. Gundry: 13:28 So the idea that you should be cramming down the bacon or the sausages or the really marbled meat, you know, Paleo or a ketogenic diet is quite frankly detrimental long term. And those of you on the carnivore diet pay attention. The carnivore diet is a really good for losing weight and it’s just like if you want to burn through a lot of gasoline quickly in your 12 cylinder engine, it’s a great way to burn through fuel. But that 12 cylinder car isn’t going to get you far down the road. And this is for longevity. So carnivore folks, you want to lose weight fast, go ahead. But it’s not a long term successful diet if you want to live well for a very long time. Dr. Gundry: 14:24 Okay. So the other thing that I want to talk about before we go is how important it is to get vitamin D into your diet. Vitamin D is a miracle vitamin. In fact, it’s not a vitamin at all. It’s actually a hormone. And if I could do anything to get you to activate your stem cells, to get you to activate these little tips of your chromosomes called telomeres are telomeres, it’s vitamin D. As I show in the book, a University of California San Diego study shows that the average person to have a sufficient vitamin D level in this country should be taking about 10000 international units of vitamin D3 a day. And I’ll bet you almost every one of you who are listening are not doing that. Dr. Gundry: 15:16 In fact, that same study showed that 40000 international units a day of Vitamin D three will not produce vitamin D toxicity. Lastly, there is a very, very, very strong association with low vitamin D levels and cancer, whether it’s prostate cancer, colon cancer, breast cancer, ovarian cancer, low vitamin D levels are characteristic of people who develop cancer. Whereas high vitamin D levels are characteristic of people who do not develop cancer. So one of the things, one of the last messages from the longevity paradox is take your vitamin D3 and don’t be afraid of it. It’s one of the greatest hormones ever discovered. Dr. Gundry: 16:03 So the book is out now, had to Barnesandnoble.com amazon.com wherever your book bookseller is, please support your local bookstores. Get it now. It’s a game changer and it’s going to keep you dying young at a ripe old age because I’m doctor Gundry and I’m always looking out for you and your longevity. Dr. Gundry: 16:30 So for more information about this week’s episode, please take a look at my show notes below and on DrGundry.com, in the show notes, you’ll also find a survey. And I’d love to find out more about you. Please take a few minutes to fill it out so I can do my best to provide information you’re looking for. Dr. Gundry: 16:49 Thanks for listening to this week’s episode of the Dr. Gundry podcast. Check back next week for another exciting episode and make sure to subscribe, rate and review to stay up to date with the latest episodes, head to drgundry.com for show notes and more information. Until next time, I’m Dr. Gundry and I’m always looking out for you. Great info and made me buy the book. I had appendaceal cancer. 3 years cancer free. Do I have to do Keto? No berries? How can I balance my diet and not be afraid? Asking questions are truly pleasant thing if you are not understanding anything fully, however this piece of writing provides pleasant understanding even.